Boasting a hardwood through tenon, our Oak Hill Amish Trestle Bench is sturdy, stylish, and solid enough to pass through your family for generations. Your Oak Hill Amish Trestle Bench is sturdy and strong in the hardwood of your choosing. Traditional in style, this dining bench is good for more than seating in the kitchen. Place it in a foyer, home school room, or breakfast nook for a fun seating option. Your Amish-made backless bench is available five lengths. Let our Amish artisans get started on your Oak Hill Amish Trestle Bench. 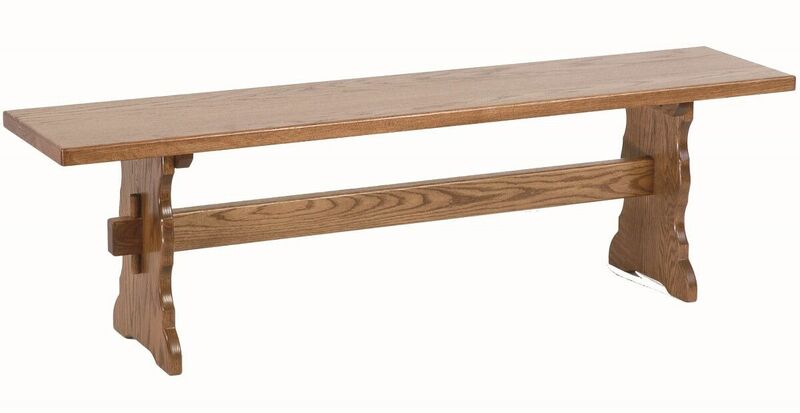 If you prefer the bench as pictured, consider Oak as your wood type and Salted Caramel as your wood finish. 48", 60", 72", 84", or 96"